It’s that time of the year again where I get to show off my skills of indifference getting my yearly quota of cyclocross out of the way. Cyclocross is that combination of joy and pain that makes you weigh the positives versus the negatives. And do I have negatives.. The pain I’ve been experiencing in my neck was returning, but not enough to keep me out of the race. It’s just that if you’re passing me, I’m probably not going to know about it until your wheel is ahead of me. The other self-induced problem was the state of my shoes. 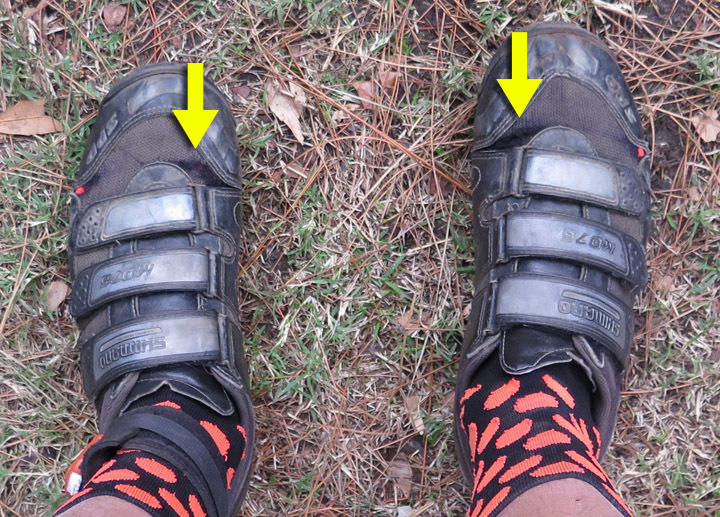 Ever since I’ve had a bike with SPD pedals, these are the only pair I’ve worn with about 15,000 miles to date. While logic will tell you I should have switched to the new pair I bought six months ago, I’ve just been watching those tears develop across my toes until they connect. Phil Gaimon said it best the day before that they aren’t shoes, but sandals. 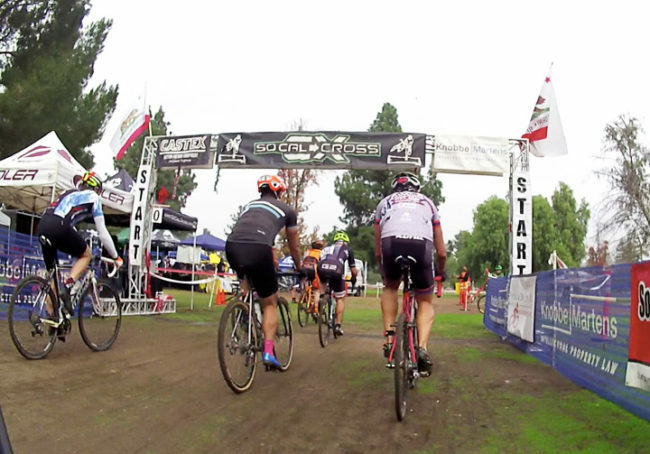 Neverless, I think SoCalCross is a positive experience for anyone, so why not? One major improvement I made from the year before was not racing with a phone in my pocket. For hundred dollars later, lesson learned. 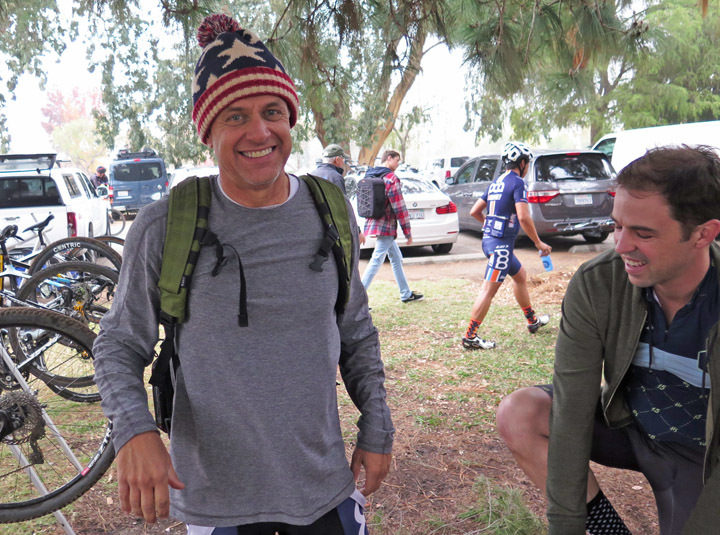 I met up with my friends Swanny and Doug at the PAA booth before the race with our attitudes sharing the same excitement / reluctance before racing cross. Swanny and Doug have smiles for miles. No matter what type of rider you are, you’re going to empty the tank as the race feels like one hundred consecutive sprints, so that may not be something you’re looking forward to. John was trying to get us to ditch our water bottles stating there is no time to drink, but I just couldn’t grasp pushing it for 40 minutes without any hydration. For those following last week’s article, I decided to go with the 32mms after a test ride through Franklin Canyon. They didn’t felt slightly less stable than my wider tires, but I definitely felt faster with them, so why not. I got to the starting area and after the 55+ went out, the top riders with points were called to the line. To my surprise, about nine people deep into the announcement, my name got called. I didn’t remember my last race was in January, so I guess I still had points? Even though I lined up in the second row, my position improved when the guy in front on me said, “I’m not supposed to me in this race” and just left. Okay. Front row start for me. The whistle went off and the clusterfun began. Once the group formed into a line, I counted that I was sitting in tenth place. About halfway into that first lap, I found myself in sixth place going into the signature feature of the ride. I don’t know how long it took Dorothy Wong to construct this, but she created this giant circular labyrinth that took five orbits to reach the middle before you reversed your rotation. It was a hard place to pass someone, but I even found myself getting dizzy and nauseous as I was exiting. As I entered this “swirl of cycling”, I was right behind Eric, who I had met right before the ride because I was checking out his sweet Niner BSB 9 RDO, a frame I’ve been eyeing as a replacement. Just as I was entering the labyrinth for the second time, I moved ahead of another rider leaving just one guy left to chase. There was a lot of race left to go and as time passed, my gap with the riders behind me seemed to grow, so there wasn’t a big urgency to catch the guy in front immediately. Still, I was pressing to make progress keeping my foot on the throttle to slowly close that gap. On the third lap just as I was narrowing in, I leaned deeply through a spot in the labyrinth where the dirt had loosened from just the riders in our wave. I didn’t waste anytime doing damage control on my bike or body, I jumped back on just hoping I wouldn’t get run over. And, oh yeah, my water bottle was caked in mud, so good luck drinking out of that from that point. Fortunately, I was ahead of the next guy by a good margin that I had time to regroup and continue the chase. The last three laps were like the previous two where I was making progress catching the leader, but only incrementally. It sure seemed on the straightaways that I was spinning twice as fast than him, but the eyeball test told me I wasn’t really gaining. At least one aspect of my riding felt like it was improving with each lap: remounting my bike after the hurdles. On the last lap, my biggest concern was that my left hand was becoming numb from my earlier fall. It was getting very difficult to feel what I was doing on sharp turns, so I tried shaking my wrist on straightaways and giving it a rest when I realized I wasn’t closing that gap. If the race went another lap, I probably would have been in quite some trouble completing it. Casually rolling over the finish line while placing is a nice feeling to have, but you always want more. If I was told that I would be finishing second before I started that race, I would have been thrilled, but the competitor in me has me thinking what I could have done to win. One thing I would have changed was going to wider tires next time around. Not only would they have helped on the slippage, but I could have pushed the straightaways even more since they were gopher hole laden. Realistically, had I even caught the leader, passing would have been a whole other thing. 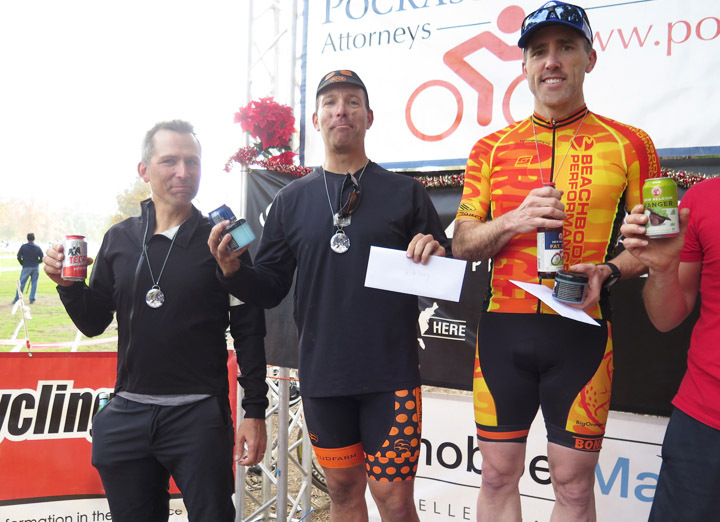 Bottom line, this was the first time I’ve stood on a podium and boy, did the frosty, cold beverage taste better. I rode home, washed off my bike and sat back as my body stiffened. 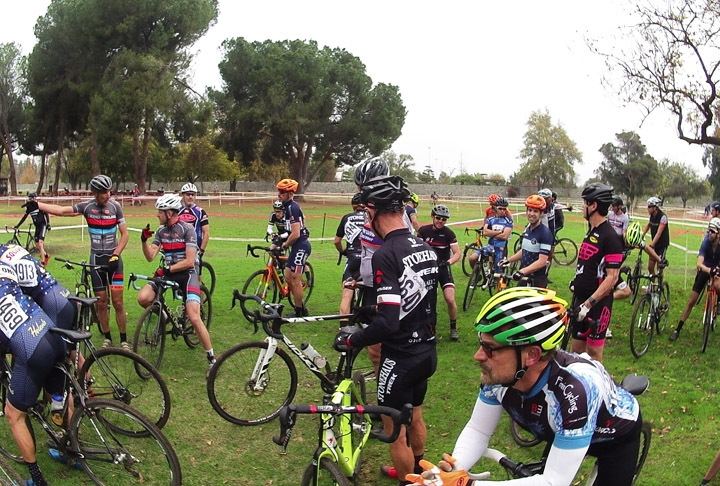 Cyclocross is a lot of fun. And you’re body will remind you of it for days.